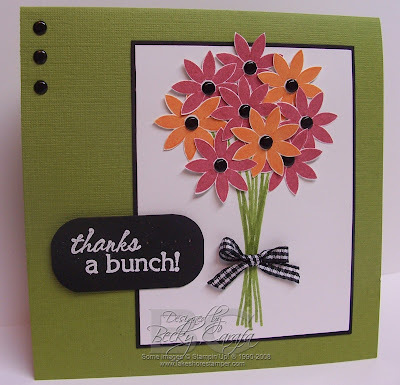 Today is another challenge over at Stamp Something, and this week's theme is A Little Something to Say Thank You. I hope you get a chance to play along! If you do, be sure to leave a link so we can check out your work. Don't forget to see what the other design team members have created. Here is my sample: I stamped a bunch of stems from PTI's Green Thumb on whisper white cs using Palette Landscape ink. I stamped a bunch of flowers in Palette Moulin Rouge and Orangerie on a white scrap and cut them out. After putting black brads in the centers, I attached them (not so) randomly on top of the stems and added a bow. The flower layer was matted on a black layer and attached to an olive textured card base (5 x 5). I white-embossed the sentiment on a black piece and rounded the corners. It's hard to see in the picture, but I added some piercing to the sentiment piece. A row of three black brads finishes off the card. I would love to hear what's on your wishlist! Becky - Great job with the challenge. The color combination you chose it stunning. I wish SU! would carry the textured cardstock in one color too. I'm with you on your wish list. I'm really hoping for single colors of textured cs also. Other than that, I don't have much in mind. They usually do a fab job with the catalog. This is so beautiful!! I love the colors!! Super cute Becky! The bouquet reminds me of wedding flowers and now I can't resist trying one on my own for that exact reason! Wow! what alot of work you put into this with all that cutting out. Beautiful card Becky! Oh, wow! Becky, this card is awesome! I love the bouquet of flowers. Very pretty!! gorgeous card!! love the colors you chose and the sentiment is perfect!! i'd love to see single colored textured card stock, it's funny how we all have a few colors that always seem to pile up!!! This is a great card! Love all the little details. I have a whole wish list of things SU would carry!! Mostly things in separate packages instead of groups, like you said. More masculine stamps, less floral. And add some single-sided DP. I love the double sided, but sometimes I want a lighter weight & don't need both sides to be DP!! Just a penny out of my dollar's worth of thoughts! This is gorgeous! Love the colors and crisp look! You've inspired me to break out those felt Fusion Flowers & play. Thanks! Becky, this is an adorable card - who wouldn't want to receive this sweet bouquet! Your color combo is beautiful! amazing card, Becky! love the black and all those flowers, just beautiful! I'm with you on SU carrying more textured cs. I would love to have it in 8 1/2 x11. I WOULD LOVE TO SEE SU MAKE A KIT OF CRAYONS OR PENCILS IN THE NEW COLORS THAT THEY COME OUT WITH EACH YEAR!! What an adorable idea! Such a cute card! very clever, love how this turned out! i'm with you on the textured cs and brads!! Love this card - it's such a happy one! I couldn't agree more with your SU product wish list - brads and textured CS especially!